The Dashboard Designer provides an easy-to-use wizard that helps you configure a connection to the database. 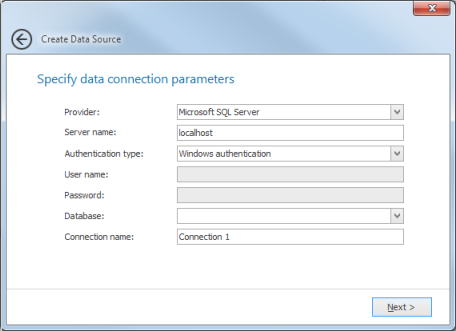 After the connection has been established, use the Query Designer to select data that will be used in the dashboard. To populate the dashboard with charts, pies, gauges and other elements, just click the desired data items in the Ribbon. Drag-and-drop data that you wish to display within each item into a Data items area. Now the dashboard is ready. Learn more about dashboard items. See Creating dashboard items. How to compose a data source in InLoox PM 8 • Copyright 1999-2019 © InLoox, Inc. All rights reserved.